Fed up with having to browse through the full list of Windows Services to find the few the one that you're trying to start. 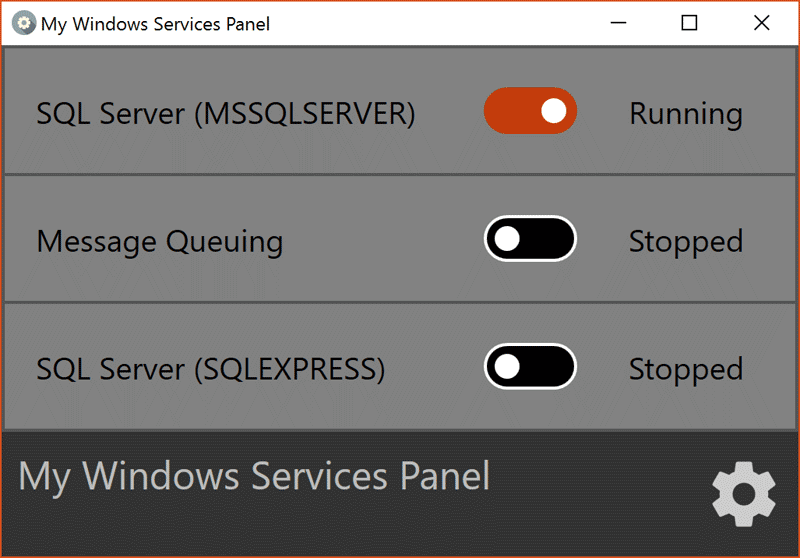 Manage Windows services you frequently stop and start like MySQL, MS SQL Server, IIS and MSMQ. Added UI improvements to the start/stop servives screen. Now much clearer when a service is in the process of starting and stopping. This program requires a Windows computer with .NET 4.6 installed. You can get the latest .NET version here. If you have any feedback, discover any bugs or have a feature you'd like to sugest please comment on or create a new issue on GitHub. My Windows Services Panel is a Garsonix product. This page was generated by GitHub Pages using the Cayman theme by Jason Long.